© Allen J. Risley and Teamrizbee.com, 2005-2010. Unauthorized use and/or duplication of this material without express and written permission from this site’s author and/or owner is strictly prohibited. Excerpts and links may be used, provided that full and clear credit is given to Allen Risley and Teamrizbee.com with appropriate and specific direction to the original content. What is the Tour de Rizbee? Six years ago, I had hit the wall of work-induced stress, over-commitment to volunteer groups, and general frustration with life. What to do? Well, to steal an idea from two of my idols (Otter and Boone from Animal House), there was only one thing to do - ROAD TRIP!!!!! But not the bacchanalia-laden excursion of the Deltas - this was to be a trip for fun, relaxation, and bonding between a father and his young son. My 12-year-old son, AJ and I had recently started to play disc golf together at Morley Field in San Diego. The game was new for AJ, but it was one of the main ways that I misspent my youth. I never felt more free or relaxed than when I played this wonderful game, so naturally this would be the perfect way to spend a few days - hitting the road for a few days to play as much disc golf on as many different courses as possible. We had such a great time on the first Tour that we decided that one was not enough! So far, we have held five Tour de Rizbees. The 2007 version included a trip to the Amateur World Disc Golf Championships in Milwaukee, Wisconsin!! We also raised funds and spread the word about Educational Disc Golf Experience (EDGE). 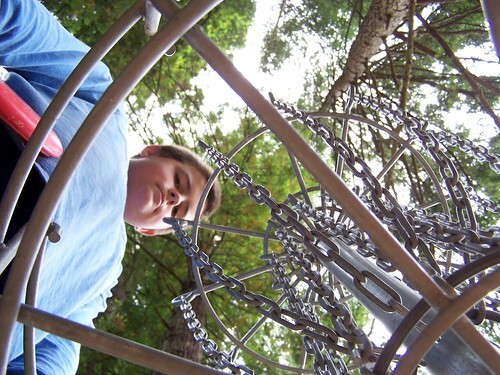 EDGE was developed by a group of World Champion disc golfers and subject matter experts to give educators and youth organization leaders the tools for teaching a fun, easy-to-learn lifetime sport to young people. EDGE also links classroom subjects such as math, science, and civics to the sport, bringing those subjects into situations that will make learning come alive. One goal of the 2007 trip was to raise funds to add the EDGE curriculum to schools and the parks program in our hometown of San Marcos, CA. We raised $800 for EDGE and ordered the curriculum for the City of San Marcos' Community Services Division - the group that runs summer camps for local kids. We also contacted local disc golfers on our route and set up "play events" where kids met us at their local course to play disc golf. It was great! Check with us on how you can join a future tour!! Check out the navigation links on the left to see more about all of our tours. Care to join us? Send us an e-mail - the more the merrier!! Visit these sites to learn more about disc golf, purchase golf discs, or decide where to play disc golf. If you'd like to see some pictures of our TdR exploits, or other Team Rizbee activities, this is the place to go. We also have links to our Flickr and YouTube pages, where you can see members of the San Diego Aces in action! The Rizbees play disc golf in SoCal and are San Diego locals. These message board threads are populated by our peeps. There have been visits to the TdR page so far!